Occasionally our customers have the need to create a new Acctivate warehouse in configuration manager. This new warehouse may be a new physical warehouse location or a virtual warehouse location either way the setup process is exactly the same. Additional warehouses, can be use to isolate inventoried products from other inventory. To do this an additional warehouse must be defined in the system and assigned to the products. The system administrator can also set this as a default Warehouse, related to a new Branch. Navigate to Inventory > Warehouse to open the Warehouse Information configuration section. Click the New button to create a new warehouse. Enter all the necessary information into the provided fields on the right side. This includes an ID, Description, Name, Address, and Inventoried GL Accounts. Feel free to create and use separate GL Accounts for these records. Check the Active box in order to use this warehouse. Click Save. The new warehouse should now appear in the Warehouse selection box, near the left among your other warehouses. 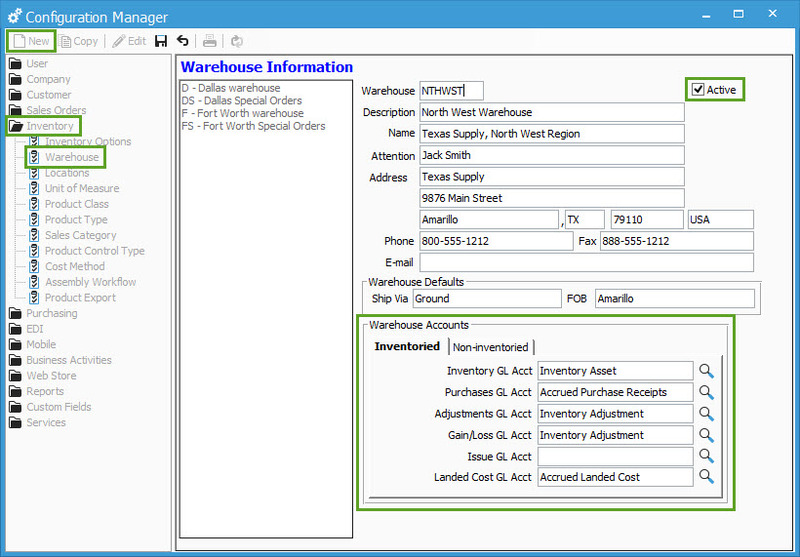 In order to have the appropriate warehouse selected throughout Acctivate, the new warehouse can be set as a default warehouse specific to each Branch. 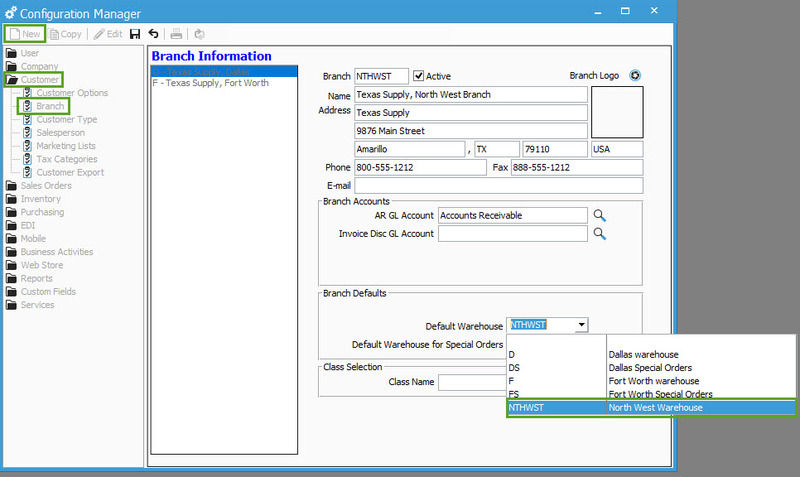 Select the appropriate branch from the Branch selection box (the list of branches on the left). Choose the newly created Warehouse in the Default Warehouse drop-down menu.